The EALR , though fictional, fits snugly into the somewhat weird and idiosyncratic railway history of this quiet coastal North Devon area. Known well for the narrow gauge Lynton and Barnstaple line, the area also boasted the little known, now extinct, B, WH & A, R , The Bideford Westward Ho! 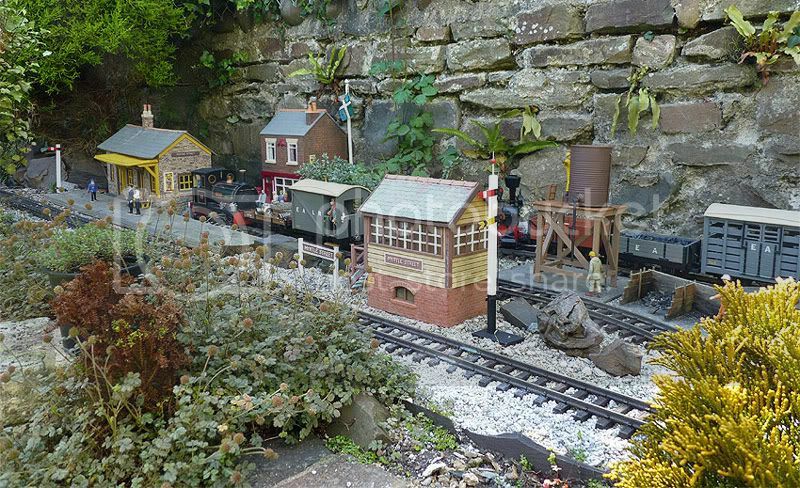 and Appledore Railway. This unusual line though standard gauge, was totally disconnected from any main network, was only eleven miles in length and had passenger train lengths of mainly two carriages and one in winter when the weather was bad ! ( they only owned six carriages in total), oh and all stock carried single buffers, Despite this the carriages were wider than standard railway networks and tended to cause consternation when traveling along the middle of the road in Bideford, ... seriously! Anyone reading the real history of the B, WH & A, R will realise that though it was perfect for modelling, people would never have believed that a line like this could possibly have existed in reality and therefore the EALR, though only a shadow of the lunacy of the B,WH & A,R, has been created with many of the same traits that made that line infamous locally. 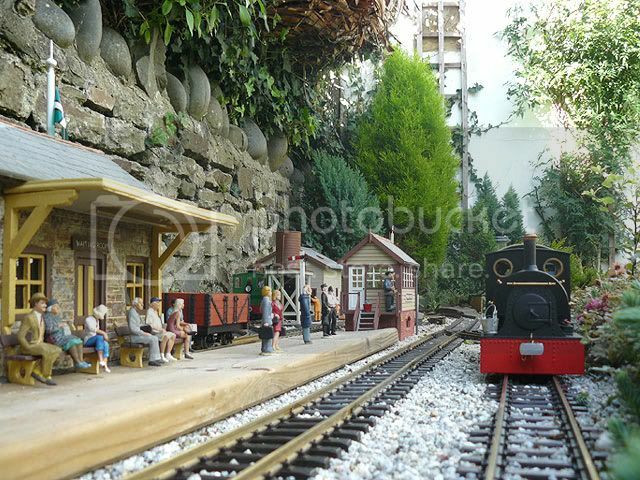 The EALR has survived by becoming a preservation railway that also serves the small fishing communities of Appledore on the coast, to those small hill farms on Exmoor. The area here has for centuries been a centre of shipbuilding in both wood and steel and, as many have been made redundant with the closing of the shipyard, the EALR has been lucky to employ some of the shipwrights to produce it's own rolling stock in the Bloody Corner Carriage Works ( Bloody Corner being a real place locally where Hubba the Dane was defeated by Odun, Earl of Devon in the late 9thC ). In line with the much lamented B,WH & A,R,, stock on the EALR is not that of other railways though keen observers will see the influence of companies like the GWR, W& L and many others. Walter, the governor, often visits other lines to see how others have solved particular traffic problems and uses this intelligence to built stock back at the works. Walter, as a traditional shipwright, tends not to work to scale plans of these wagons but lofts them up in the Carriage Works, much as ships have been traditionally for years, so though the influences can be seen, they are by no means identical and like ships, may be a little pointed at one end! from a local sheep farmer, one Wendolene Ramsbottom, to be able to move stock from her farm on the moors to the quay for shipping onward. 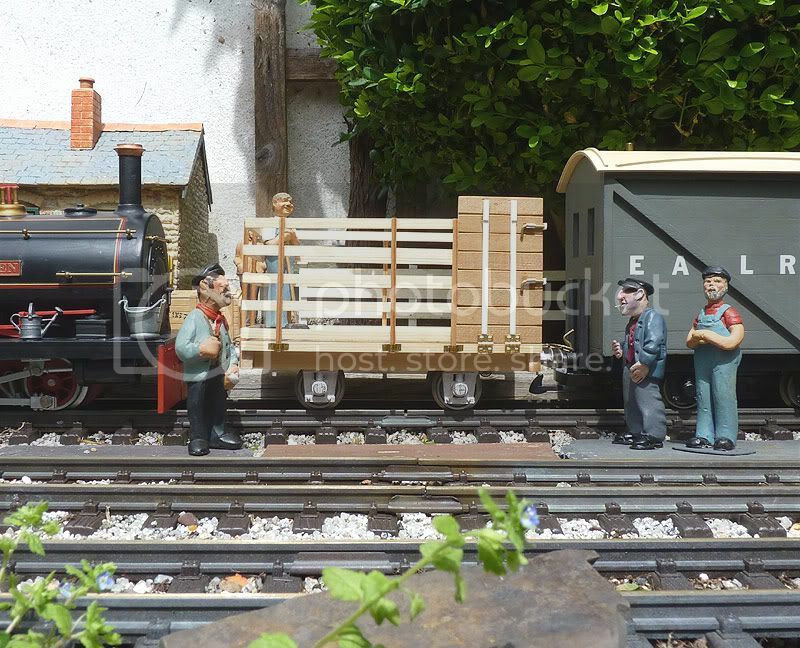 Aficionados of wagon construction will notice a similarity to a Sheep Wagon run on the Welshpool and Llanfair. After painting, the sheep wagon is prepared for duty on the line and discussions start over where the sheep can be found!